. إن الخدمات الممتازة وحسن الضيافة العالي في Acapulco Motor Inn تجعل إقامتك تجربة لا تنسى. يقدم هذا الفندق العديد من الخدمات الكفيلة بإرضاء أكثر الضيوف تطلباً. تتضمن كل غرف النزلاء وسائل الراحة والتسلية المصممة خصيصاً لضمان الراحة القصوى للضيوف. يقدم الفندق مجموعة واسعة من وسائل الراحة المتنوعة، كمثل: حوض استحمام ساخن, مركز للياقة البدنية, ملعب للأطفال, حديقة. إن Acapulco Motor Inn هو خيار ذكي بالنسبة للمسافرين، فهو يوفر إقامة هادئة ومناسبة للاسترخاء. Our room was newly renovated and we were very pleased with everything. Bed was comfortable and room well furnished. Bathroom even had a jacuzzi tub. Not on the water but a short block from lake and many restaurants. Happy with everything and well worth the money. The motel was minutes drive away from the city centre and various shops which was really convenient. The room and furniture were a little dated, but since it was a short stay for us we had no issues. Kitchen and living room was small and not much facilities on the property. Free wifi and parking. We booked this venue for my family's recent trip to Taupo and it was the one of the best equipped accommodation from our trip. My wife personally felt that the venue is really thoughtful with the various items provided. The receptionist was courteous and helpful. Family also spent time at the spa bath - a good plus. It is a short drive away from the eateries and thus, we do appreciate the quiet surroundings and there is an English bar just down the road. Within a short walk, we are at Lake Taupo where we witnessed some lovely sunsets. It is also close to the jetty and also the supermarket, making this a wonderful stay for my family with young kids. highly recommended. I booked the twin standard studio and the unit was big enough to easily accommodate 3 people. The room was super clean and the beds were comfy as well. Aircon also functioned as heater, shower gel and shampoo provided smell amazing. There was a guest laundry on site, and the price was only $2 each for washing and drying. Overall a fantastic experience! Such a comfortable stay! The pictures do not do the place justice! Very central to Taupo, not too near the main shops so you do not get the noise and traffic, but close enough to walk. Imagine having a meal and then walking along the lakefront to catch the sunset, and back to your hotel, to a spa bath in your room and then binge on all the shows they offer through an amazing Sky package all through the night!!!! Amazing stay, clean, fantastic stay. Thank you Acapulco! We booked for two rooms almost 3 months in advance and we requested both rooms next to each others while checkin hotel staff told us no room available next to each others and we had given rooms corners. one is next to cleaning store & other one next public Laundry. Hotel Staff was bit rude and not willing to listen to us. WE will not recommend this hotel to anyone. Excellent place with complete facility. Just walking distance to the great lake. I love it. Good hotel for the short visit we had. There are so many thing that I like about this motel as mentioned above. Love the studio room and all the facilities provided inside. We traveled with a young baby and she slept through the night without any problem because they have got heat pump unit, the weather temperature in Taupo at night can be much colder than daytime so we were quite happy and will definitely stay there again next time. Recommended to all travelers. Our family greatly enjoyed our stay here. The rooms were very clean and comfortable. We were provided with kitchen utensils and equipment in the rooms so that we were able to eat in our rooms easily. The kids were very happy with the number of TV channels provided. However, we had trouble connecting to the internet - it was very slow and sometimes had no connection. Overall, it was a good experience, although a little bit pricey - maybe because we went during holiday season and the location was close to the lake. we came to taupo to celebrate our anniversary weekend. im glad i stayed at Acapulco Motor Inn. very standard rooms very neat & tidy. All my special request were full filled so i didnt have to call te customer service to request for anything. everything was just the way i requested for. the most i enjoyed was the whirl spa pool .... amazing ..... if anytime im staying in taupo than definitely its at Acapulco Motor Inn and no where else. plus its not too expensive. the price and standards match very well. Parking just in front of room,and eventough the room quite old design,but we felt very comfort and like to stay here,kitchen stuff complete where we can make tea and coffee nicely. 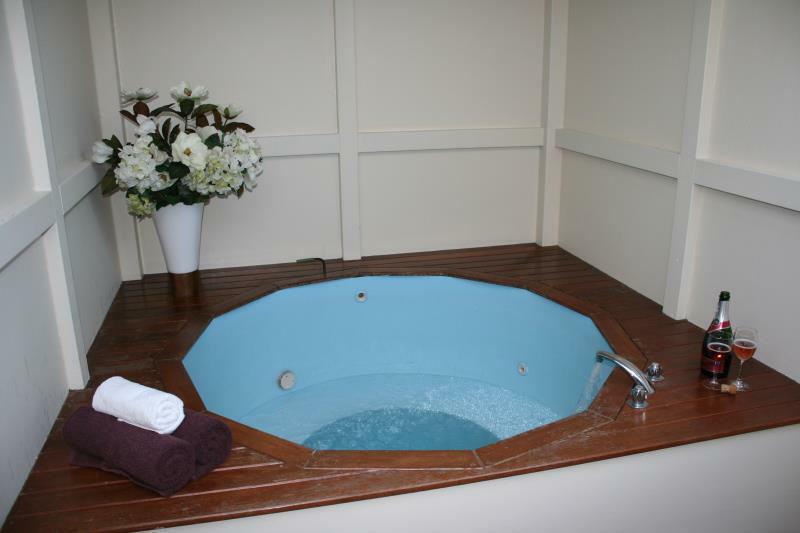 And the best thing is they have jacuzzi so we can soak in hot water and turn on the wave to massage. What a lovely one night stay. Late check found windows open at night and lots of insects in the room. Rushed out of room at checkout. Fresh and clean room with good facilities. Staff are friendly too. Only short drive to town center and restaurants. Highly recommended. Town house is awsme . Will definitely recommend this place if you travelling with family. Everything was perfect. Clean medium-size room. Kitchenette has microwave, toaster, plates & cuttery, but no stove or pots & pans. Friendly & helpful staff.